Kikiktagruk Inupiat Corporation (KIC) is an Alaska Native Corporation organized to serve the Inupiat people of Kotzebue, a community above the Arctic Circle in Northwest Alaska. KIC infuses the traditional values of the Inupiat people, who are descendants of Alaska’s first people, into its workplace culture and business partnerships. These values include adaptability, honesty, hard work, cooperation, integrity and a commitment to quality. Bringing more than 40 years of experience in delivering exceptional service to our government customers. Add your name to receive our current newsletter. KIC exists to serve our shareholders. From funding scholarships to developing businesses, KIC provides a wide range of opportunities for our people today and for many generations into the future. Headquartered in Kotzebue, KIC was formed in 1973 as a village corporation under the Alaska Native Claims Settlement Act (ANCSA) of 1971 to enrich the lives of our Iñupiaq shareholders and descendants. KIC is an Alaska Native corporation focused on creating new opportunities and services for our almost 2,000 shareholders, while preserving and promoting our traditional Inupiat values. 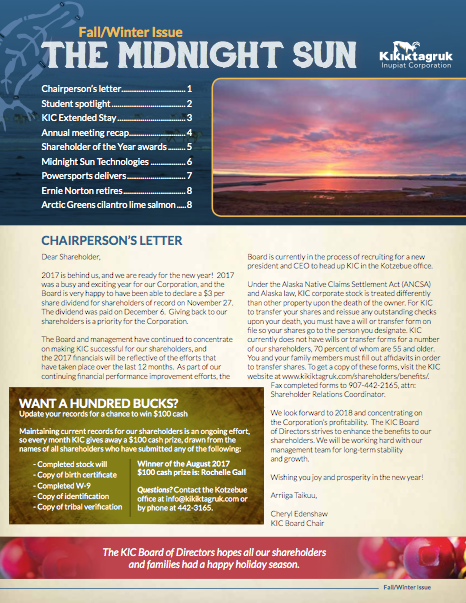 Kikiktagruk Inupiat Corporation (“KIC’) voted to void the August 14, 2018 Shareholder meeting and hold a new meeting and election. Read the letter by Martin Shroyer ,Vice-Chairman here. KIC needs your help! We have several incorrect addresses for shareholders that need to be updated, and we’ve lost some shareholders who still have unsettled shares. Please check the list HERE to see if you need to update your records. Having up-to-date records ensures we can communicate with our Shareholders and distribute important information. Sitemap Copyright © Kikiktagruk Inupiat Corporation 2016.